Last week I entered into my 4th year of actively participating in the season of Lent, with ashes on my forehead as well. No, I am not Catholic, as some might quickly assume. I am a Protestant. I do, however, attend weekly mass and spend quality time in meditation at a local Catholic church. This practice started three years ago when my mother, a practicing Catholic, passed away shortly before Lent. 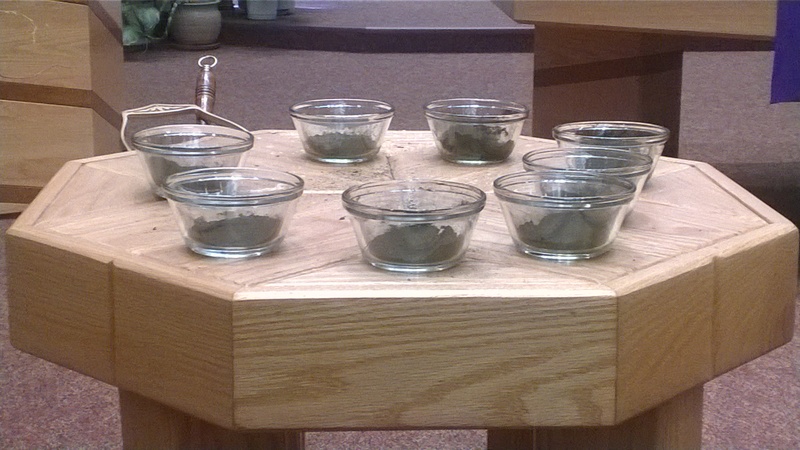 Cups of ashes from the Ash Wednesday service. It was in those first times of prayer there that the Lord showed up, gave me incredible peace, and started to speak to me in ways I’d never experienced before. Those weekly visits became my Lenten practice that first year. I’ve continued ever since, but not just for Lent. Those first few months when I had one foot in my Protestant Church and another at the local Catholic Church were very difficult for me. I knew God was doing something in me. I knew/know that my identity in Christ was/is secured. What I learned about myself in the process is that I am a contemplative, as described in the book Sacred Pathways by Gary Thomas. It is how I best get in touch with God. I came to understand that it didn’t matter if I was Protestant or Catholic. It is faith that pleases God (Hebrews 11:6). 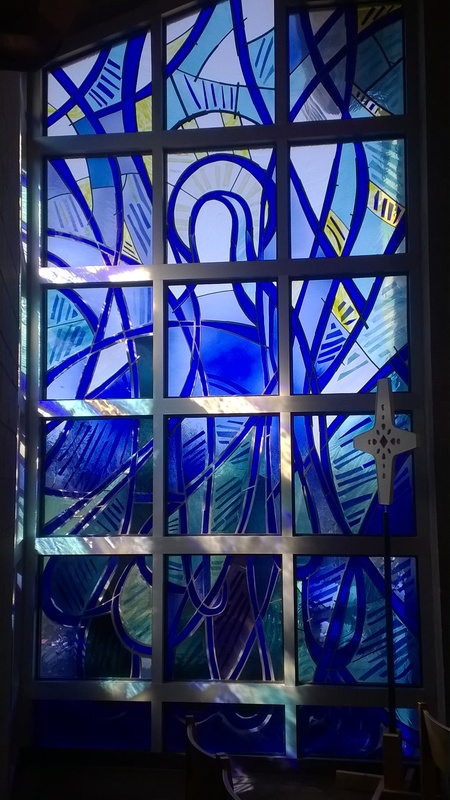 In light of my unique perspective, I thought I would share with my readers what it is like for me, a contemplative Protestant, to worship in a Catholic Church. In so doing, maybe some of my readers won’t judge the Catholics so harshly, or maybe the Protestant Churches could learn something about this as well. I am not advocating one way or the other is correct. It is merely my perspective; and I am not a seminary student, an ordained minister, or a theologian. First of all, I believe that no church can ‘meet’ everyone’s needs. Yes, Jesus can meet all of their needs, but the way one church structures their church service, or the ‘vibe’ of the church, will not appeal to everyone. I don’t think it is about structure; it is about content. It is about preaching the Gospel of Jesus Christ. 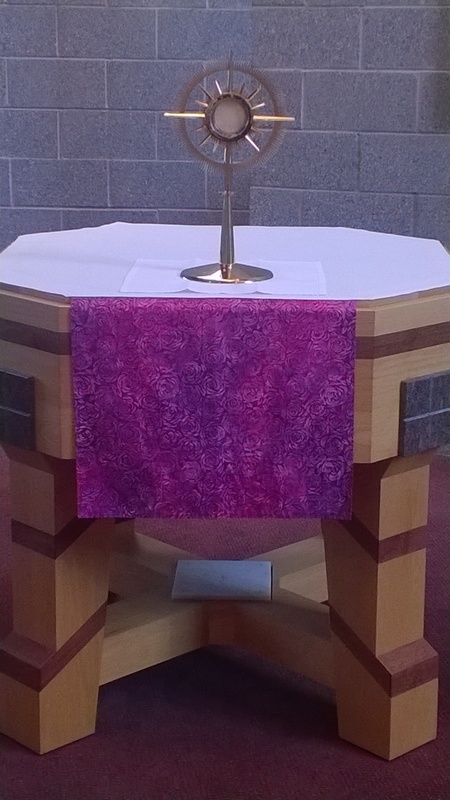 One thing that is consistent about the Catholic Church is that they all have a set structure or order to the mass. They even have the same scripture readings in all churches throughout the world, as dictated by the head of the Catholic Church. (Not sure exactly if that is the Pope or some organization under him. As I said, I’m not an expert on this. The idea here is that it is divinely revealed as to what scripture is read worldwide.) Those scripture readings are published in various publications and online. I have to admit that in the past, I was one of those people who felt that the mass was just a bunch of rote responses and prescribed prayers. As I’ve come to view it and take it in, I see that it is a beautiful dialogue between God and His people. One could just say the responses, but I prefer to contemplate and say the responses in praise to God. There is also deliberate quiet time in mass, albeit, much too brief for my liking. It is all a rhythm back and forth. To me it feels like an invitation to encounter God. It is a sacred time. I covet this time and notice a dramatic difference in my level of peace when I miss it. Well, that’s a glimpse into my sacred space. If you are reading this post on a Wednesday morning, you could actually walk into the small chapel of that church and see me praying, reading scripture, or journaling my conversations with God. My friends and family all know I’m there, interceding on their behalf and talking with God. But now it is late Tuesday night as I write this, and I will turn in so I don’t miss my weekly appointment with God. *Live locally and interested in what those ripple effects are? You can request information about my next speaking opportunity through my Contact Page. What a lovely and inspirational post! Your experience inspires me to reclaim my sacred space that I neglect when my schedule gets pulled in different directions. Fortunately I do have a 24/7 connection that I am thankful for but the time set aside to be in solitude slips away from me at times and getting back to that takes a matter of priority and recognizing that. I sure enjoy reading about your journey.